The most obvious sign someone has survived a stroke is usually some trouble speaking or walking. But another challenge may have an even greater impact on someone's daily life: Often, stroke survivors lose sensation and muscle control in one arm and hand, making it difficult to dress and feed themselves or handle everyday objects such as a toothbrush or door handle. Now, doctors and engineers at Stanford and Georgia Tech are working on a novel therapy that could help more stroke survivors regain the ability to control their arms and hands – a vibrating glove that gently stimulates the wearer's hand for several hours a day. Caitlyn Seim, a graduate student at Georgia Tech, started the project in the hope that the glove's stimulation could have some of the same impact as more traditional exercise programs. After developing a prototype, she approached Stanford colleagues Maarten Lansberg, an associate professor of neurology, and Allison Okamura, a professor of mechanical engineering, in order to expand her efforts. With help from a Wu Tsai Neurosciences Institute Neuroscience seed grant, the trio are working to improve on their prototype glove and bring the device closer to clinical testing. 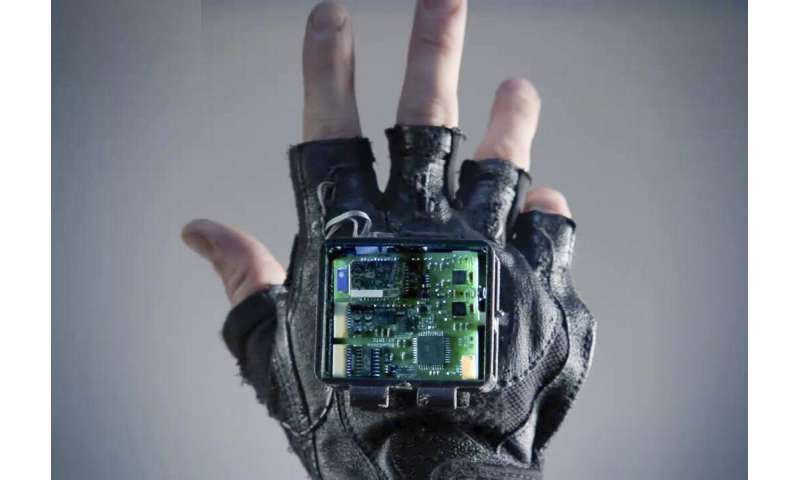 "The concept behind it is that users wear the glove for a few hours each day during normal daily life – going to the supermarket or reading a book at home," said Seim. "We are hoping that we can discover something that really helps stroke survivors." Seim, Lansberg and Okamura's goal is a tall order. Despite some individual success stories, the reality is that most stroke patients struggle to regain the ability to speak, move around and take good care of themselves. "Stroke can affect patients in many ways, including causing problems with arm function, gait, vision, speech and cognition," Lansberg said, yet despite decades of research, "there are essentially no treatments that have been proven to help stroke patients recover these functions." It was in that context that all three researchers independently started thinking about what they could do to improve the lives of people who've survived strokes. As the medical doctor in the bunch, Lansberg had already been treating stroke patients for years and has helped lead the Stanford Stroke Collaborative Action Network, or SCAN, another project of the Wu Tsai Neurosciences Institute. Okamura, meanwhile, has focused much of her research on haptic or touch-based devices, and in the last few years her lab has spent more and more time thinking about how to use those devices to help stroke survivors. "Rehabilitation engineering provides a unique opportunity for me to work directly with the patients who are affected by our research," Okamura said. "The potential to translate the kind of technology relatively quickly to a commercial product that can reach a large number of stroke patients in need of therapy is also very exciting." For her part, Seim's interest in stroke stems from an interest in wearable computing devices – but rather than build more virtual reality goggles and smartwatches, Seim said she wants to apply wearable computing to the areas of health and accessibility, "areas which have some of the most compelling problems to me," she said. With that ambition in mind, Seim built a prototype vibrating glove that she hoped would stimulate nerves and improve both sensation and function in stroke survivors' hands and arms. After collecting some promising initial data, Seim reached out to the Stanford team. "Stanford has SCAN and StrokeNet, along with a community of interdisciplinary engineering and computing research, so I reached out to Maarten, and he was very supportive," Seim said. Now, Seim, Lansberg and Okamura are revising the glove's design to improve its function and to add elements for comfort and accessibility. Then, they'll begin a new round of clinical tests at Stanford. Long term, the hope is to build something that helps stroke survivors recover some of the functions they have lost in their hands and arms. And if initial tests work out, Lansberg said, it's possible the same basic idea could be applied to treat other complications associated with stroke. "The glove is an innovative idea that has shown some promise in pilot studies," Lansberg said. "If proven beneficial for patients with impaired arm function, it is conceivable that variations of this type of therapy could be developed to treat, for example, patients with impaired gait."